Most auto accident cases settle, which can take anywhere from a few days to a few months. At most, a case might take six months to resolve without having to go to trial. In the St. Louis area, it takes approximately a year for a case to go through the jury process. If you are not sure how long a typical motor accident case takes to resolve, contact a Motor Vehicle Accident Attorney right away. What Factors Constitute a Viable Auto Accident Claim? I disbelieve in the theory that one injury is better than another; I really don’t think it’s a fair assessment for clients. Of course, damages do make a difference, and more severe injuries will usually result in greater damages. A jury will consider both how badly a person is injured and how reliable they are. The insurance company has an obligation to look at these things, and they must go through their compliance with people as well. They look at these things to make sure that they are fairly paying people out for the injury they are associated with. The last thing an insurance company wants is for someone to take a case to trial because then they will have to spend money just to fight the case. Why Does Someone Need an Attorney When They Have Been Involved in an Auto Collision? A person should not try to handle an auto collision case on their own. As the saying goes, “The person who has himself as a lawyer has a fool for a client.” In other words, please don’t do that. That’s what the insurance company is looking for because they are looking for ways to manipulate you. I believe that if the insurance company is ready to pay you an amount of money without a lawyer, then you are probably entitled to significantly more than what they are offering you. If they don’t pay out and you do go to court, then you are held to a legal standard as well. So, the court is not going to give you any leeway because you are a layperson and not a lawyer. Once you have decided to handle a case without a lawyer, you’ve injected yourself into the court system. As a result, the court is obligated to treat you as if you were a lawyer. 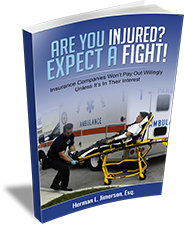 The insurance companies will go at you aggressively, and they will normally win. A lot of people think that they can get more money if they do not hire a lawyer because they won’t have to split the fees, but I would suggest that you talk about that with your lawyer. Talk about the fees that you don’t want to share, and discuss those limitations. I don’t know how to deal with that sort of client, but I’m sure that there are lawyers out there who will talk about a lesser fee if. It’s always in the best interest of anyone who’s injured to at least have someone who knows how to approach the system and rightly get what belongs to the client. This is why it is important to contact a Motor Vehicle Accident Attorney if you have been in a car accident in Missouri. What Sets You And Your Firm Apart in Handling Auto Accident Cases? It’s just that we really care about what we do. It’s not just a motto or spinoff; it’s something we really do. It’s important that people be well around us and empowered through us. We think it is important for people to be informed of their rights. If we can vindicate our clients’ rights and get the system moving in their favor, then we’ve done our job. We are also highly experienced. I’ve been a lawyer for 31 years now, and I’ve seen it all. I have vast litigation experience regarding things in all cases. Ultimately, that’s not as important as getting the client to know what they are entitled to, both monetarily and in terms of their rights. That’s what the insurance company doesn’t want you to know. One call and that’s all you need to get us; the right lawyer on your side. If you talk to a lawyer, make sure that they are up to date on the recent developments in the law. In January, a new law called “No Pay, No Play” went into effect in Missouri. This law states that if an injured driver had no insurance during the six months leading up to an accident, then that injured driver cannot have a claim against the other driver, regardless of who was negligent. Even if someone was 100% at fault for an accident that seriously injured or even killed someone, the injured person will receive no recovery. The issue that remains to be litigated is how to go about handling an injured passenger who was insured. There are no definitive answers on this yet, but it’s important to have insurance. In terms of limiting the rights of the individual, the insurance lobby in Missouri is strong. We need to be very vigilant about what we are doing and proceed in a way that has the best recourse. Having said that, there is an exception, which is that if the driver was under the influence of an intoxicant, then that rule doesn’t apply. This is something that the insurance company won’t reveal to you; you must discover it in order to find out. If you have been in a car accident in Missouri, you will need details on how to resolve your case quickly and effectively. For more information on Resolution Of An Auto Accident Claim, a free initial consultation is your next best step. Get the information and legal answers you are seeking by calling (314) 786-3536 today. We have competent and experienced Saint Louis Car Accident Lawyers working with us. Home > Personal Injury > How Long do Auto Accident Cases Typically Take to Get Resolved?